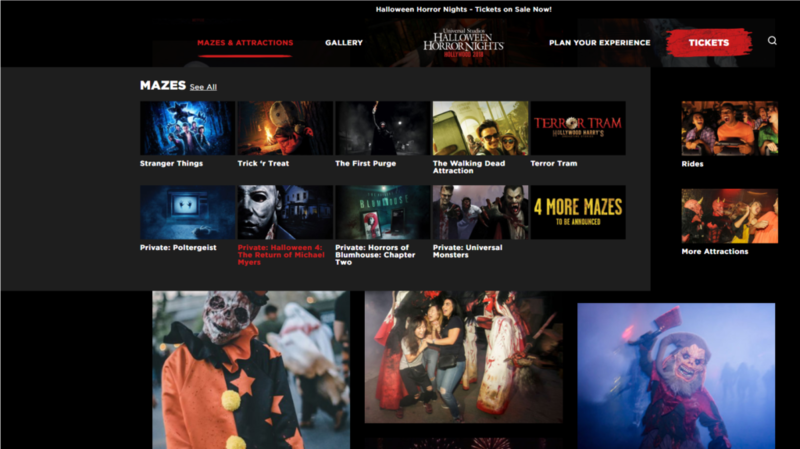 April marks the halfway-point to Halloween season, and if you’re like us, you’re experiencing serious withdrawal from haunts while also starting to get excited for the 2019 season. But Fall is still so far away, so if you just can’t wait, there are a few events in the near future that may help tide you over. 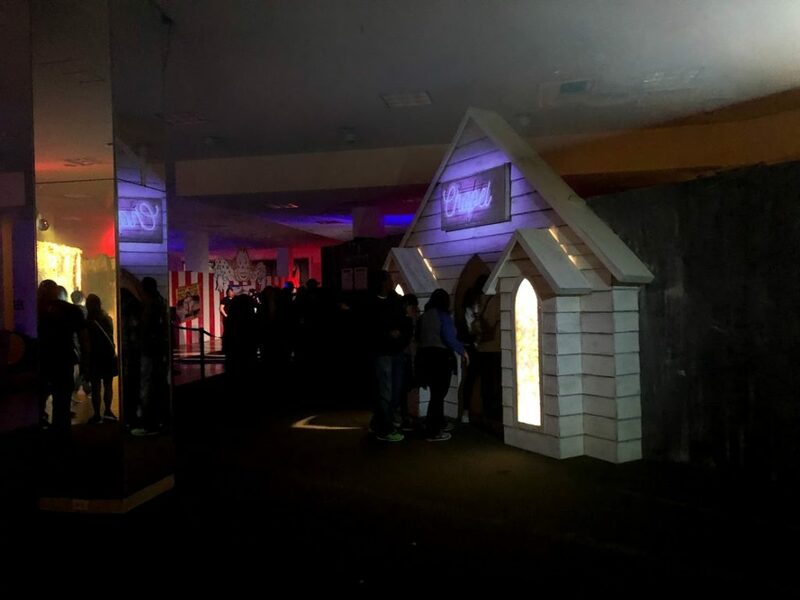 This pop-up “experience” immerses guests into their favorite horror films, including IT, A Nightmare on Elm Street, Beetlejuice, and The Shining. The space boasts 25,000 square feet of Instagram-ready photo ops. 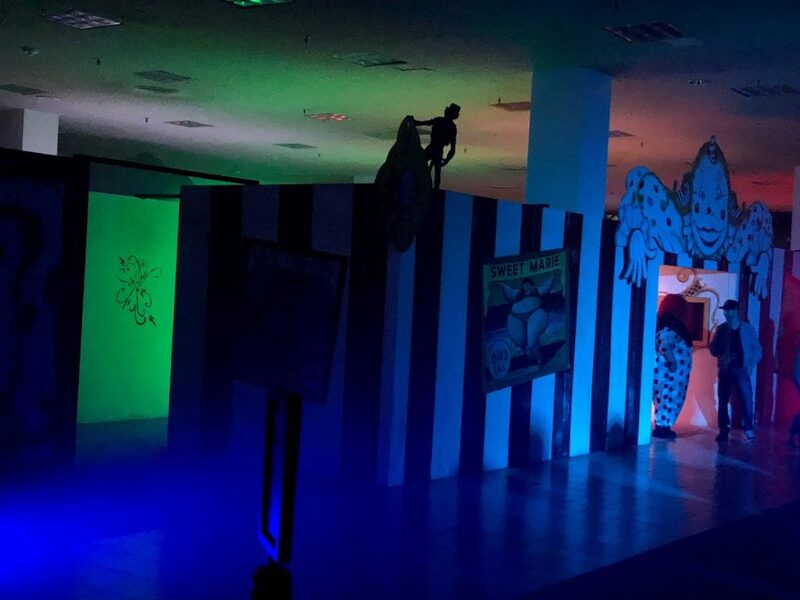 Although there are no scareactors, you’ll be able to pose with Freddy’s glove, sink into the carpet of Overlook Hotel, and pose with maggots in Chinese Food Box (a la Lost Boys). Tickets are $39 for an approximately 90-minute experience. Spook Show started out as a horror “swap meet” of sorts but has quickly grown into a must-attend shopping and entertainment event for any Halloween enthusiast. 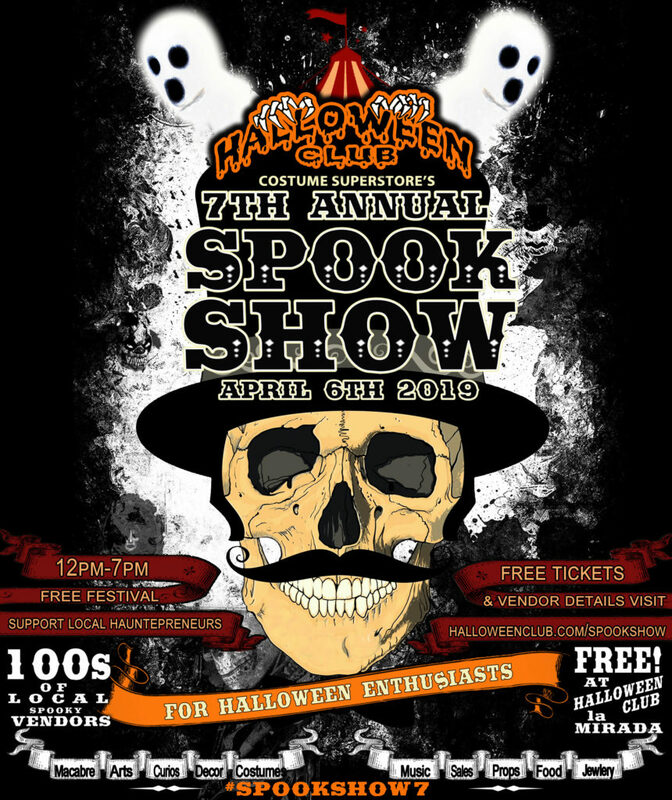 Put on by Halloween Club (which we’ve all seen on the way to Disneyland), the event includes more than 100 vendors, artists, musicians, and other spooky folks. Halloween Club will also be clearing out a wide array of costumes and props at a great discount. Live music, food, and spook shows by Doctor Zomba’s Ghost Show of Terror round out the event. And the best part? Tickets are free! But you must register ahead of time to guarantee entry. Spook Show 7 runs from 12-7 pm; costumes are encouraged. To register, visit their website. 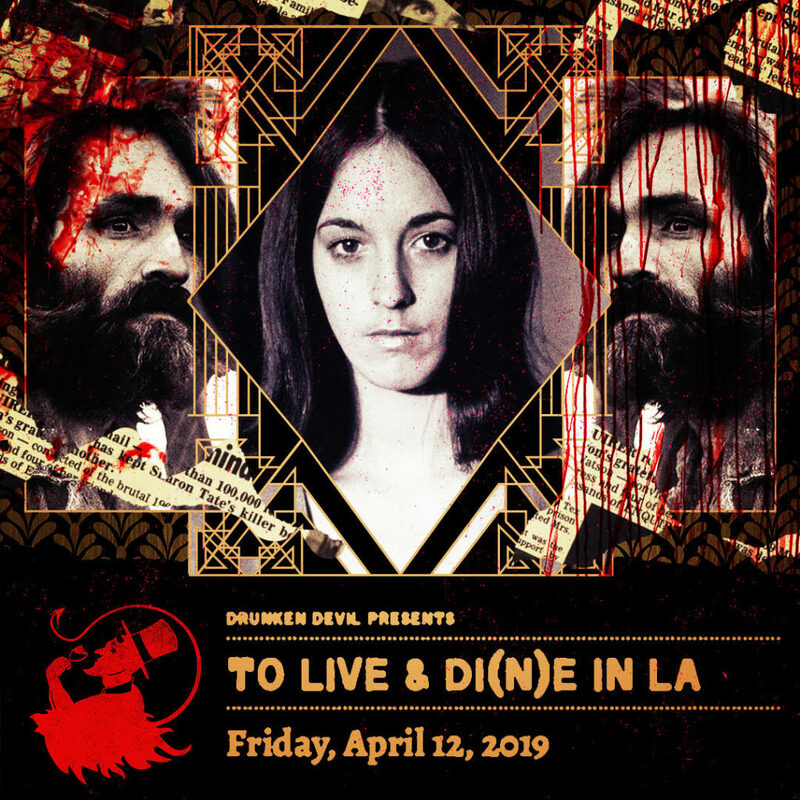 Drunken Devil brings the debauchery back this spring with a new event called “To Live and “Di(n)e in LA.” This event is an immersive dining experience in which guests will encounter the spirits of some of LA’s most notorious criminals and victims, including the Black Dahlia, Charles Manson, and the Night Stalker. Not only is each course of the meal paired with a themed cocktail, but it also ties in with one of these true crime figures. If you’ve ever wanted to sip some Mezcal next to a serial killer, here’s your chance. Tickets are $200, which includes the 3-hour show and full-course meal and cocktails. You must be 21 or over to attend. All Saints Lunatic Asylum is one of Southern California’s premier independent haunts, and they consistently put on off-season events worth the drive to Apple Valley. 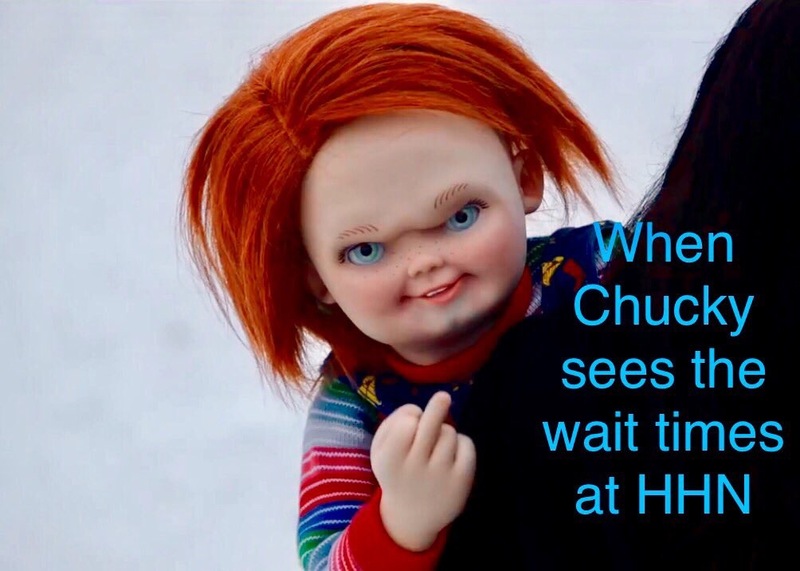 Their annual “Rotten Egg Hunt” returns in 2019, bringing the evil Easter Bunny and friends along with it. This is the only Easter weekend haunt event in the area, so if you really need a good scare, don’t miss this. Friday and Saturday, April 12-13, 7:00 to 10 pm. Tickets are $13. 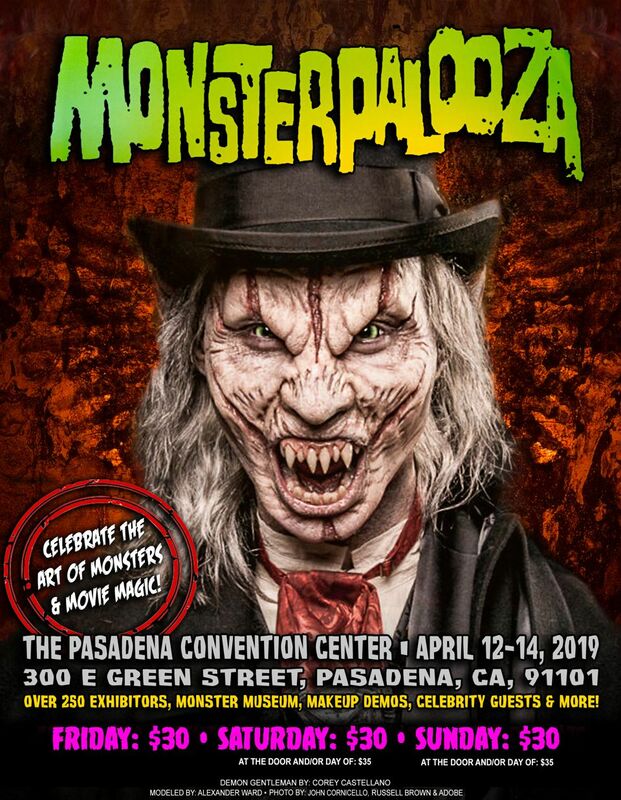 Monsterpalooza runs Friday through Sunday, April 12-14 at the Pasadena Convention Center. Daily tickets are $30 online or $35 at the door. Be sure to get their early as long lines can form, and there’s a lot to see. 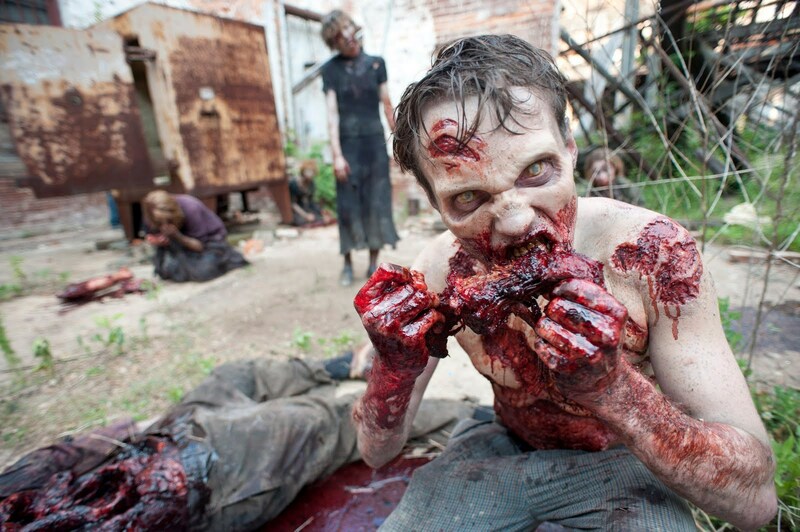 If you’ve never experienced a Zombie Joe production, now is the time. This spring, the Underground Theatre presents Blood Alley, an all new horror-theatre spectacular! Zombie Joe’s Underground Theatre Group proudly presents their All-New, Brutal and Razor-Sharp Horror-Theater Spectacular in the great Grand Guignol, Theatre of Cruelty and Butoh-Traditions, centering around the traumatic memoirs of a forgotten street-alley haunted by the longing, beauty and unspeakable events of its cold, diabolical past! The show opens May 24 and runs on selected dates until June 1, with two performances each night. Tickets are $15, which is an incredible bargain for the theatre experience. 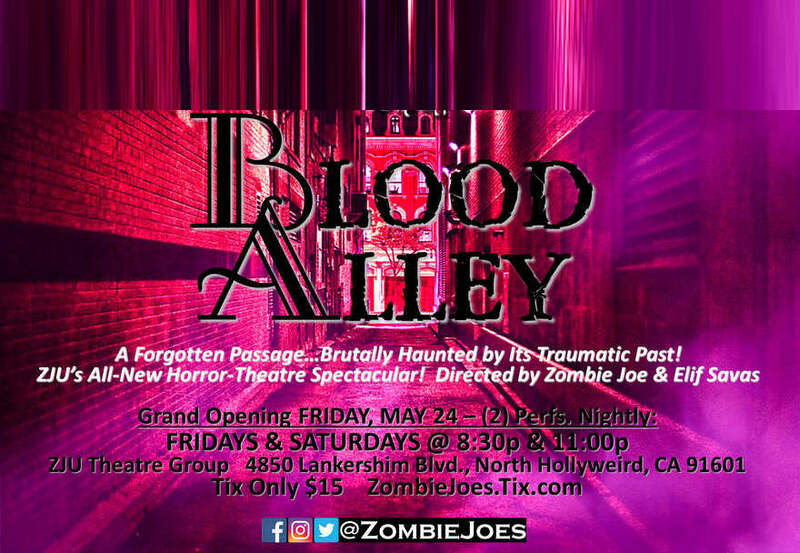 Seriously, instead of going to another Disney or Marvel movie, get a ticket to Blood Alley for a night you’ll remember. We know the genie in the live action Aladdin looks frightening, but Will Smith will be no match for the horrors you’ll experience at Zombie Joe’s! Trust us. 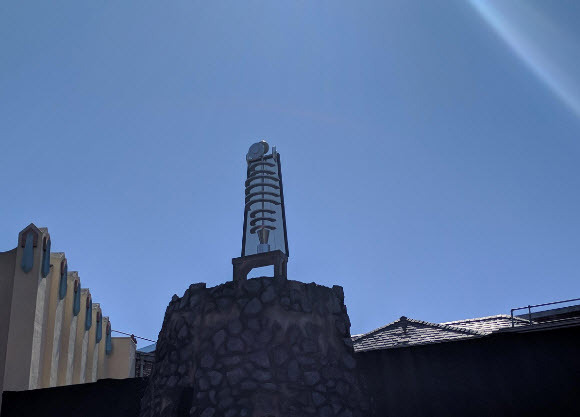 If you follow our site, you’ll know that Las Vegas is the home to our long-favorite haunt, Freakling Bros. For years, we’ve encouraged our Southern California haunt fans to make the trek out to Nevada to experience this awesome haunt for themselves. But with the recent demise of Fright Dome, and the buried skull of a haunt called Bonnie Screams, there has been a bit of an “empty grave” when it comes to other worthwhile haunts in the area. Which is crazy, because Vegas is such a prime destination for adult thrill seekers. Fortunately, this year, a new horror-based escape room is looking to fill that gaping grave. “Zoe,” presented by Escaped Vegas, will debut at Bally’s Las Vegas on Saturday, October 27. Branching out from its original location in Southern California, where it achieved an impressive 5-star Yelp rating, Zoe is taking up residence on the Las Vegas strip, where it will be open not only this Halloween season but also year round. 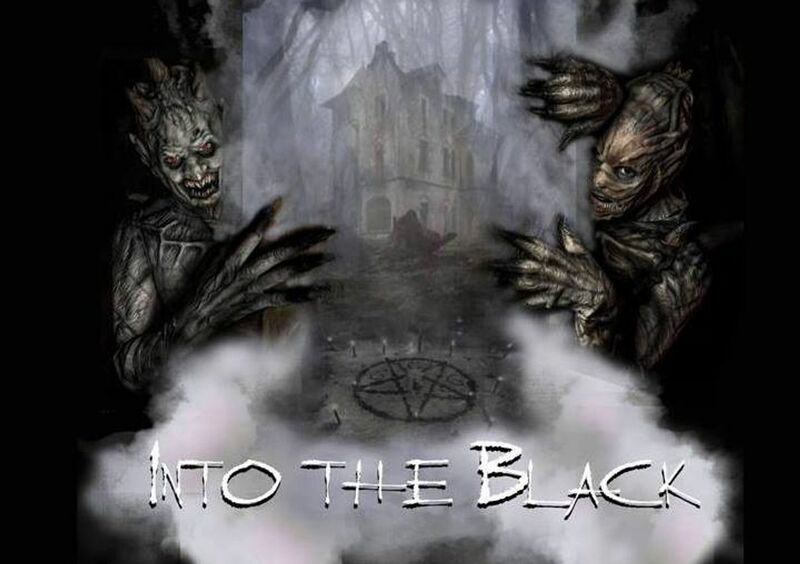 This 45-minute experience is described as “interactive live theatre” promising “frights, horrors, and fun.” Like any good escape room, guests will work in a small group to solve puzzles and challenges as they make their way through a series of haunted rooms, with the goal of freeing the trapped spirit of Zoe. 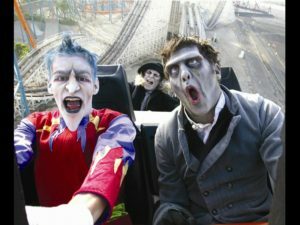 But you’ll really need to be on your toes, because the attraction includes live actors who will provide “startling surprises” and raise adrenaline levels. 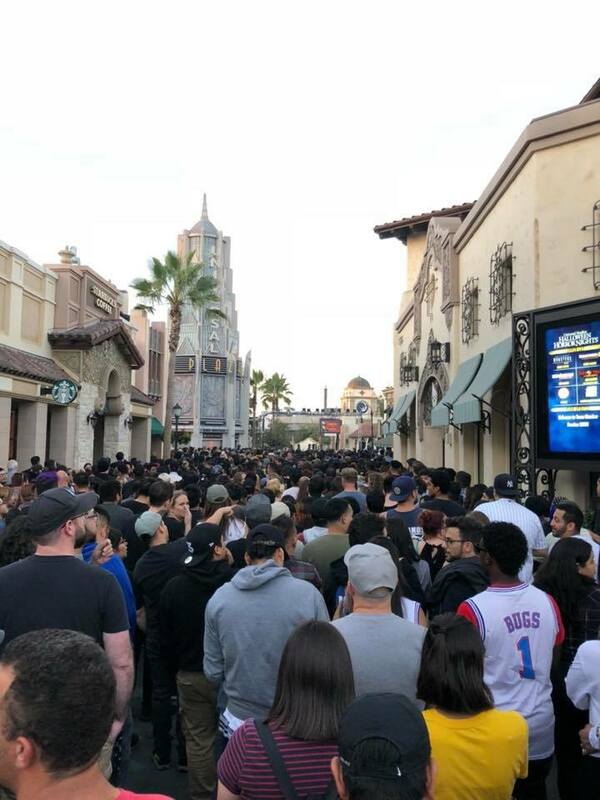 In addition, the attraction offers two levels of scares: Between 10 am and 8 pm, the experience is suitable for those aged 13 years and older; but after 8 pm, the terror is elevated, and only those 16 years or older are permitted. Tickets prices start at $45 and can be purchases at Ticketmaster or in person at any Caesars’ property box office. 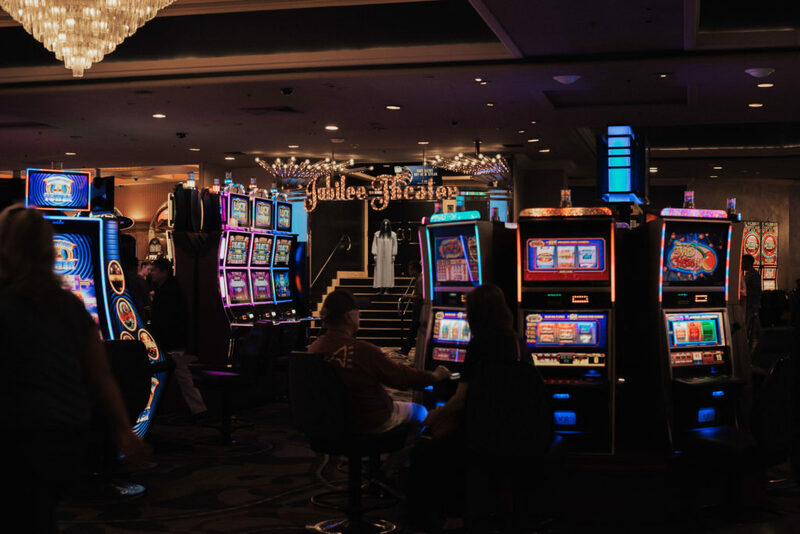 We hope to make the journey out to Las Vegas to experience Zoe for ourselves soon; in the meantime, head over to our Instagram page to find out how you can win tickets for you and up to 5 friends to experience Zoe in Las Vegas! 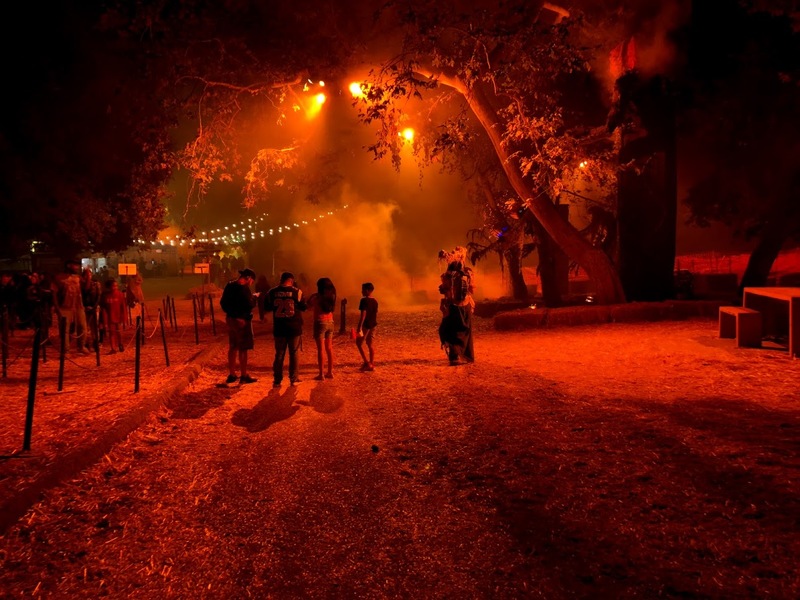 In 2009, the Los Angeles Haunted Hayride (LAHH) made a somewhat quiet debut at King Gillette Ranch in Calabasas as the first large-scale hayride attraction in Southern California. Sure, there were a few local farms offering hayrides, but they just didn’t live up to standards set by the many famous East Coast hayride attractions (such as Headless Horseman or Bates Motel). After earning great reviews in their first year, LAHH moved to a more central LA location: the Old Zoo at Griffith Park. Their dedication to providing an excellent attraction combined with heavy marketing (and promotion of celebrity attendees) made their event one of the top “must-see” Halloween attractions in the area. 10 years later, they are still unchallenged as the only major hayride in California. 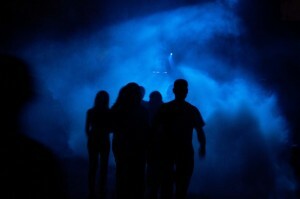 In addition to the hayride, the event also includes two walk-through mazes and event grounds (“Purgatory”) populated by roaming scareactors and shows. Now, let’s take a roll in the hay and get to the review! 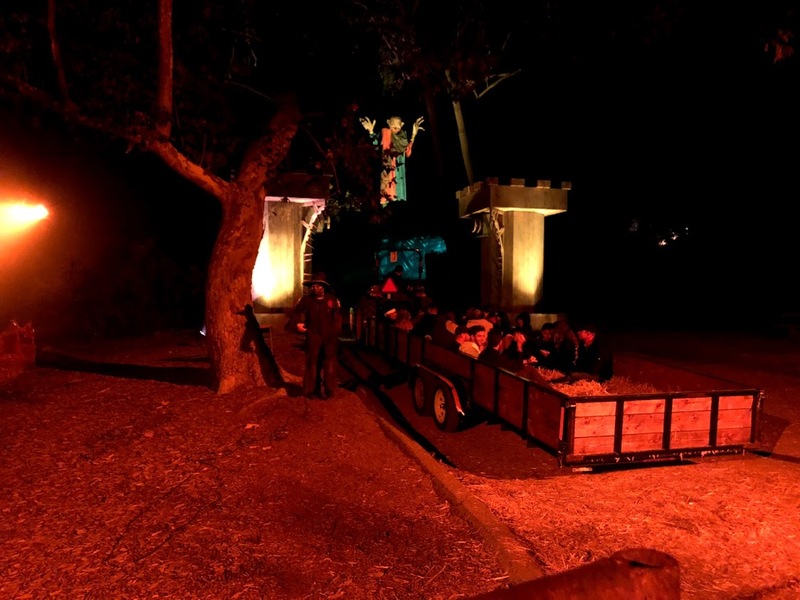 The theme of this year’s hayride is, appropriately, “10 Years.” Instead of a single theme or backstory, this year’s ride plays like a “best of,” featuring scenes and characters from the past decade. This was a smart change in direction, because creating a coherent story line has proven to be difficult for many hayrides, not just LAHH. By abandoning the constraints of a single backstory and instead featuring stand-alone vignettes of horror, the hayride has become a lot more fun as well as more scary. The 10-year theme has also enabled them to feature all their best props, sets, and masks in a way that doesn’t feel forced. This freedom keeps the riders from having any idea of what might be coming next, increasing the suspense and surprise. And if you don’t like one scene, chances are the next one will have something to scare you. The hayride begins with a journey through the fog. 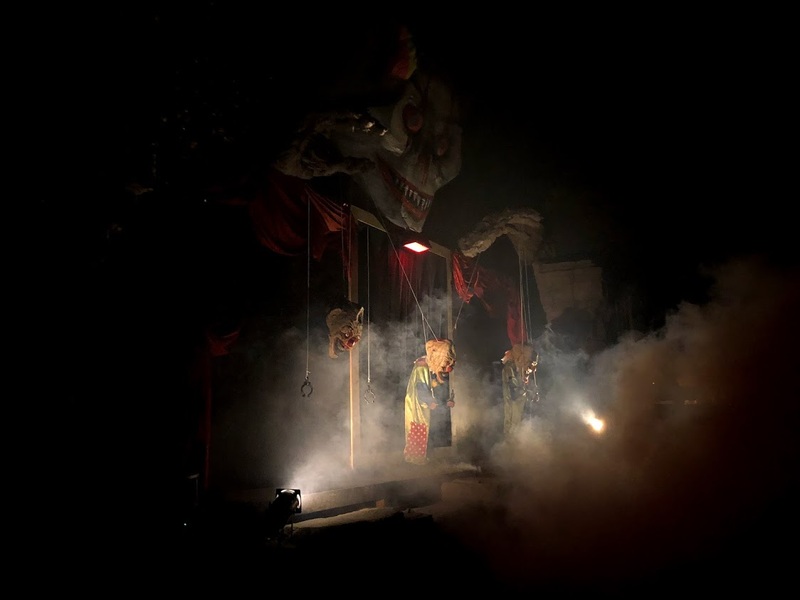 As you leave the grounds of the Haunted Village below, you are quickly bombarded by one scene after another, which vary widely from a spooky church scene, to an amusing game show of death, to a terrifying tent full of demented clowns. We were struck by how well-choreographed the actors were in each scene, as some effects required very close synchronization to get the effect just right. The actors also used each other as distractions; while one actor terrified guests from the left, another silently snuck up on the other side for a scare. 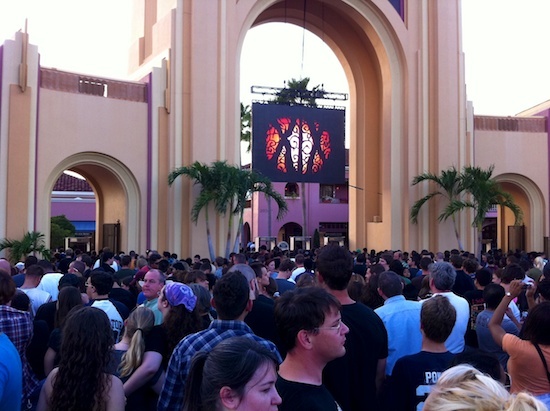 The energy level was high in nearly all scenes, with creatures running after the trailer, jumping on the rails, and leaning far into the crowd as guests scrambled to get away. This was the best group of actors we’ve seen on the LAHH to date. Although the LAHH tried its best to conceal the actors in the shadows and use surprise tactics to elicit scares, we just didn’t find it to be that scary overall. 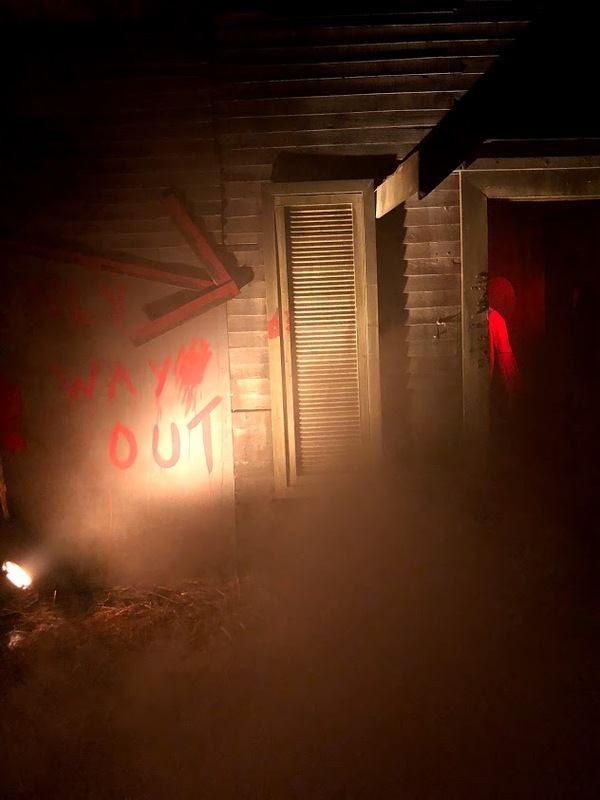 This might be just us–maybe we find the confines of the twisted hallways of a walk-through attraction to be scarier than sitting in an open trailer. 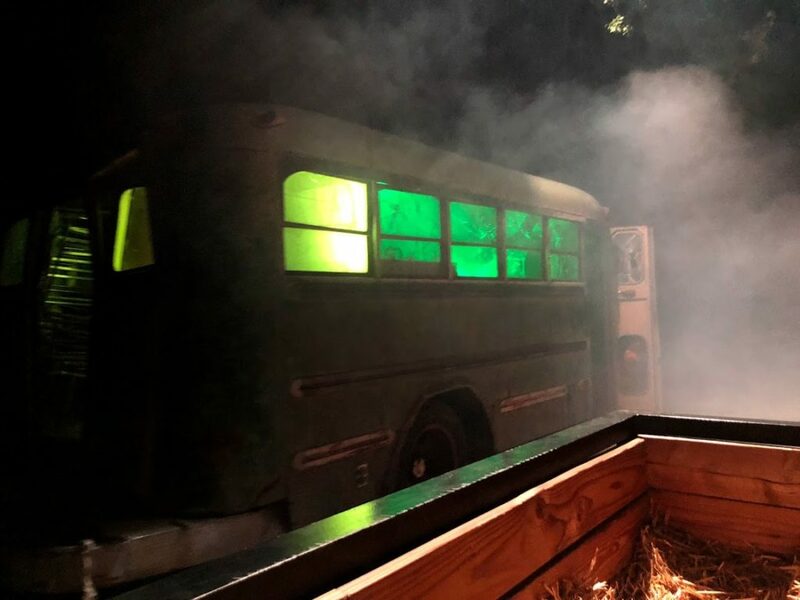 But with a hayride, the actors are limited to jumping on the sides of the trailer, and the suspense that is needed to create an effective scare is just really hard to pull off in this setting. However, the LAHH provides a great spooky, Halloween atmosphere with plenty of eye candy to make it well worth the journey. Treat or Treat returns this year as one of the most unique walk-through attractions at any Halloween event. Very small groups are let onto the trail, which resembles a rambling path through house-like facades. Guests have to knock on the doors, where they will get a treat (piece of candy) or a trick. The tricks are, of course, the fun part here, and these scares can be really effective. We definitely screamed more on this path than we did on the Hayride. Trick or Treat is not to be missed, and the long lines are a testament to its popularity. This bare-bones walk-through has one unique thing going for it: it’s an actual maze. And you will get lost. The plain black walls and headache-inducing strobe light ensure you’ll be disoriented and begging for the exit before long. Monsters lurk in the shadows and behind walls, and they purposely lead you in the wrong direction. This maze is a fun distraction but is probably not be worth it if there’s a long line. 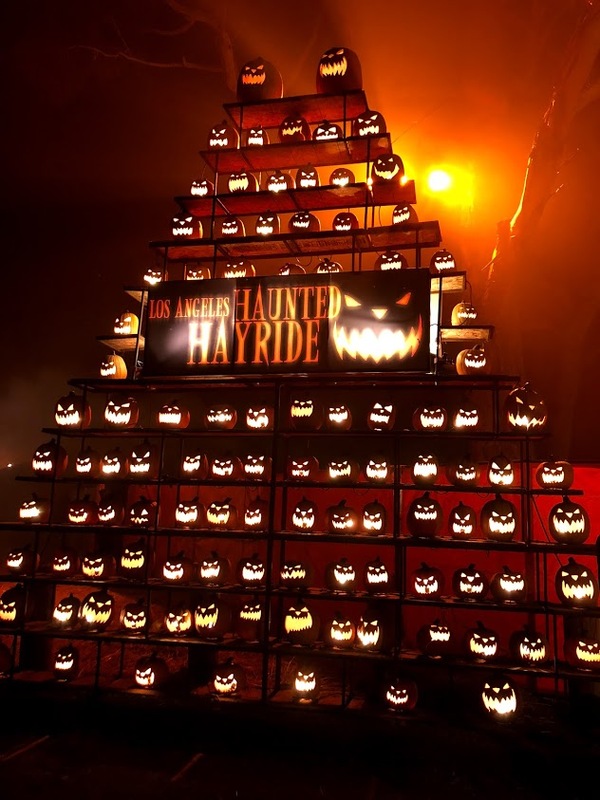 The Los Angeles Haunted Hayride continues to be a solid Halloween offering and is a great choice for anyone looking for something a little bit different than the standard walk-through haunted house. There’s plenty to do to fill up your evening, and the Purgatory grounds are full of Instagrammable spots. The vegan offerings at the food truck are delicious, and there’s plenty of free parking. We attended late on a Sunday evening and found the hayride line to be completely empty, although there was still a healthy line for Trick or Treat. Attending later in the evening or during the week is a good option if you want to avoid the lines and the need to buy a VIP ticket. LA Haunted Hayride is open through October 31. Tickets are now on sale. Walking up to the 17th Door Haunted Experience, the first thing you’ll notice is the abundance of signage warning you about the attraction. 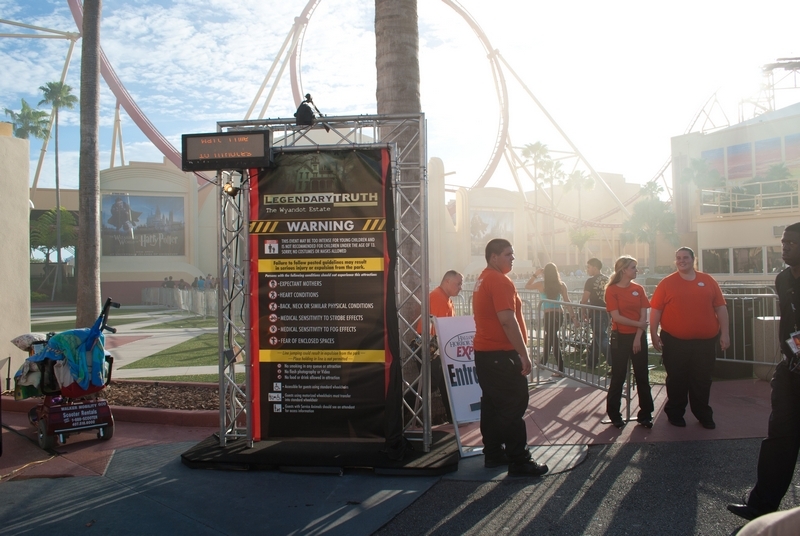 “This is a physically demanding and potentially dangerous attraction,” according to a giant sign on the chain-link fence that surrounds the queue area. “TRIGGER WARNING” shouts another sign, which warns you that you’ll be exposed to sexual assault, infanticide, insects, and small spaces, among other potential horrors. One small relief provided by these signs, however, is that the weapons used inside are only replicas. Phew. And if that’s not enough, all guests (or victims) must sign a detailed waiver, acknowledging that you could be hurt, shocked with electricity, and even shot with projectiles that may leave welts and bruises. Oh, and if you die, it’s not their fault. In reality, these warnings are somewhat truthful, as 17th Door is currently the most extreme haunt in Southern California. But they’re also a clever trick to help amp up the anxiety and anticipation as you wait in line. 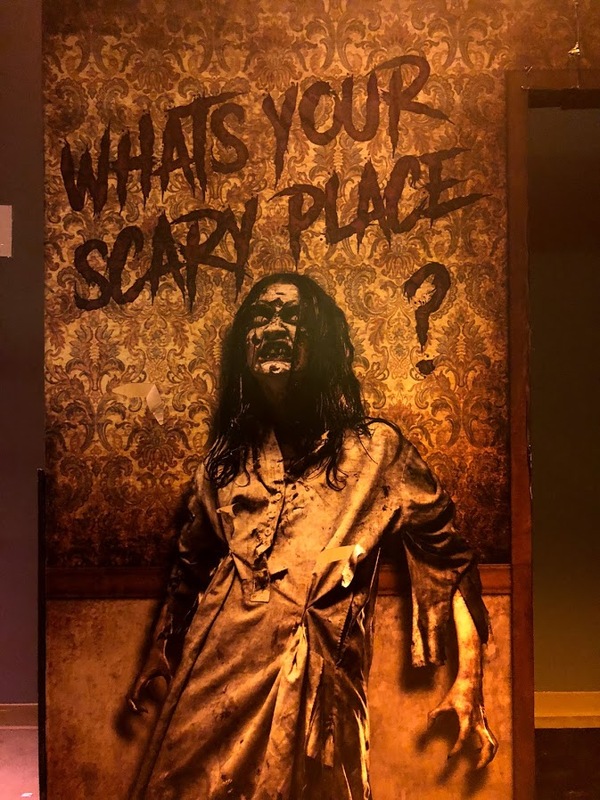 While we do think 17th Door is suited for more advanced haunt stalkers or those looking for a more physical thrill experience, rather than first-time haunt visitors, overall, it’s not too extreme and can be handled by most people. Here’s our review of 17th Door’s 2018 incarnation: Crybaby. This year, 17th Door takes up residence in the back of a strip mall, which was actually the location of Sinister Pointe in 2016. This year’s story once again centers on Paula, the hapless young woman who was a raped and then found herself pregnant with a baby she didn’t want to, and couldn’t, care for. Paula murdered her infant and is now locked up at Perpetuum Penitentiary, where the poor conditions have caused her to sink further into desperate madness as she sits on Death Row. As a new inmate of the penitentiary, you’ll get a first-hand look into Paula’s hell and experience it along with her. 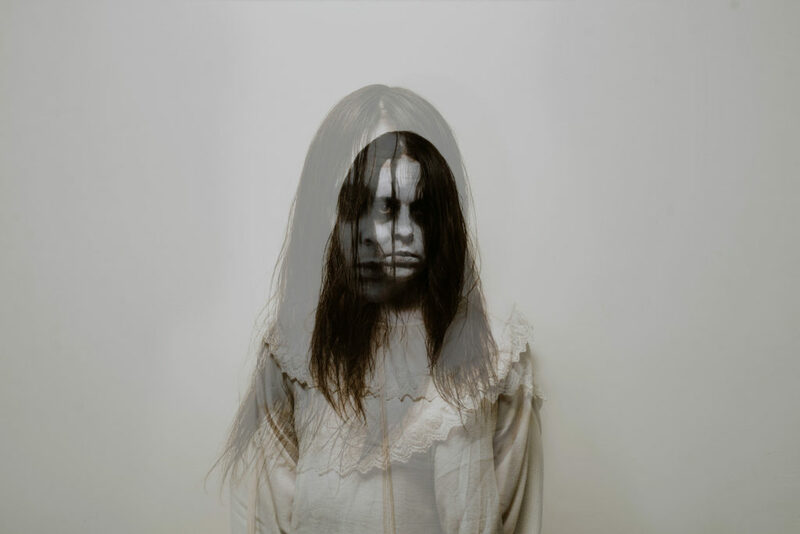 In our opinion, Paula’s story is the most depressing we’ve ever encountered in the haunt world. Although the attraction paints her as “evil” and “perverse,” it’s hard not to feel bad for Paula, who seems to have fallen into her situation undeservedly. Not to mention the fact that the story also features a dead baby, whose face pops up continuously throughout the experience. We’re generally not that sensitive to topics of haunts and feel that almost nothing is really off limits when it comes to haunts, but the backstory here is so miserable that it actually makes the attraction less “scary.” However, it is effective in making you care about Paula as a character, which adds surprising bit of empathetic nuance to such an “extreme” experience. The first scene was (appropriately) the admissions room of the prison. We were given the rules and manhandled by some very good actors. The attraction supposedly has 17 rooms, and hence 17 doors to go through (but we saw a door numbered “18,” but who’s counting?). Small groups go through the attraction room by room, and each scene is appropriately timed, with doors that can’t be opened until a green light goes on. As we made our way through the attraction, we interacted with guards, (nearly naked) inmates, prison psychiatrists, and of course, Paula herself. Paula, who isn’t adjusting well to prison life, carries a small doll that represents her dead son, Lincoln. We see her attempts at art therapy, which turns into a psychotic gallery when the lights go out. 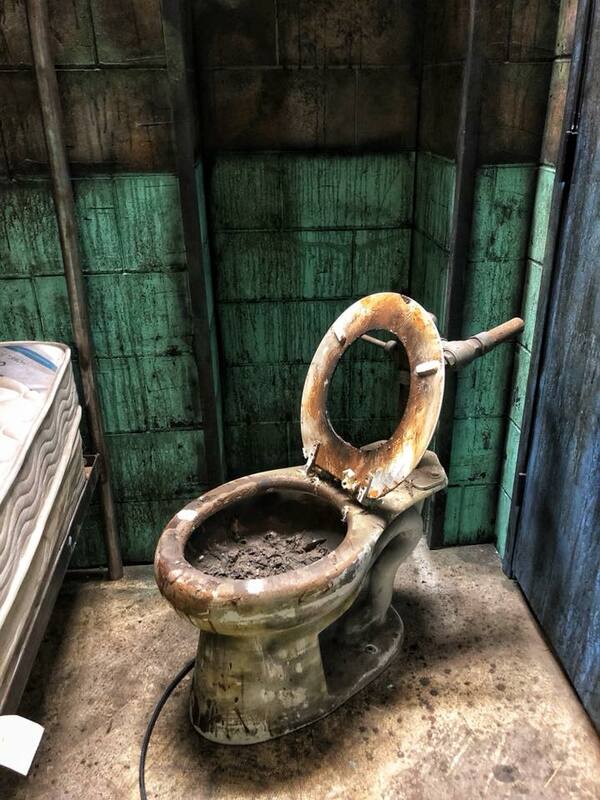 Other stand-out rooms include a putrid bathroom, an execution chamber complete with electric chair, the guard’s locker room, and the firing squad gallery. Nearly every room had its own mini-story, complete with either a scare or some kind of physical interaction. Despite the large number of rooms and characters, the scenes managed to adhere to the overall story very well. Although prison settings are nothing new in haunted attractions, 17th Door has made Perpetuum Penitentiary a fully immersive experience. We were impressed with the level of set detailing in each room, as well as with the variety of lighting, sound, and fog effects that seemed perfectly timed. Although we don’t want to give away any of the big surprises, we will let you know about some of the “physically demanding” aspects of the attraction. First of all, if you have serious claustrophobia, this attraction is not for you. There are several moments that require squeezing into small, dark spaces. (However, if you’re a larger guest, don’t worry–they can accommodate you.) There is some mild electricity as well. However, the “surprise” of it is probably worse than the actual shock. They also warn you about insects, but we didn’t see any live insects in the attraction. There was a single scene in which an actor appeared to be throwing insects on guests, but it was dark and we couldn’t see what the objects actually were. Is 17th Door Actually Scary? As we drove to 17th Door, we actually found ourselves feeling a bit of dread. Not because we were scared, but because we weren’t exactly looking forward to being physically tortured. We’re actually not fans of extreme haunts. MacKamey Manor, Blackout, Alone–we don’t really consider these to be haunts. But 17th Door straddles the line in a very smart way. 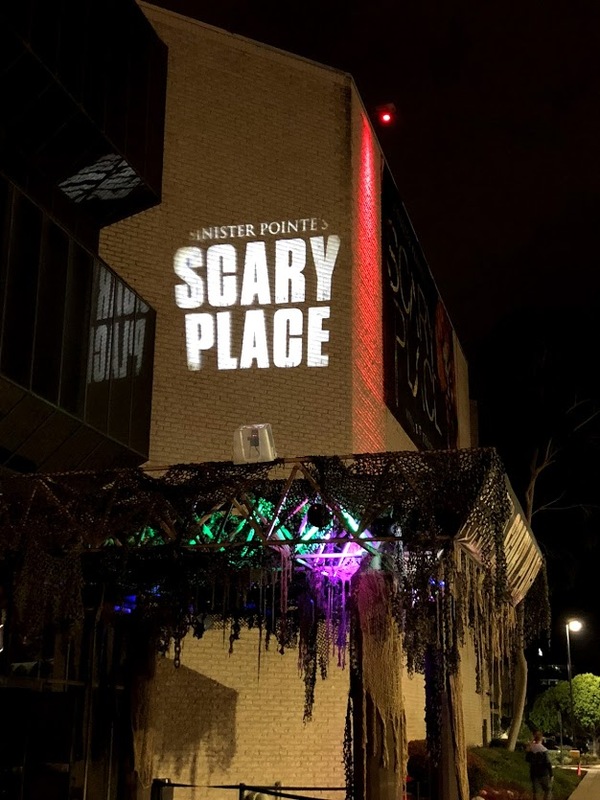 Their detailed sets rival some of the best haunts, and they do throw in a good number of jump scares to relieve the tension and elicit some laughs throughout. But the main draw is the physical stunts. Shocks, falls, pushing, getting “shot” at– you can’t do these things at just any haunt. But at the same time, we don’t find these things to be scary. 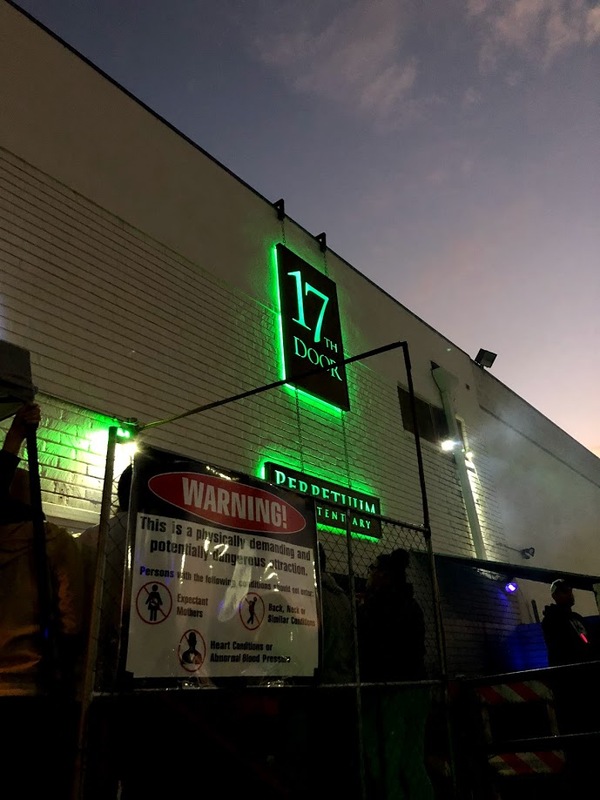 exaxctly But for those looking for something a little out of the ordinary and want to push their boundaries a bit, The 17th Door is perfect. 17th Door is open through October 31. Tickets are now on sale. 17th Door also offers a VR experience for an extra charge ($13), which we did check out. In 2017, buzz was strong for the freshman haunt Into the Black, which took up residence at the Pomona Fairgrounds. Created and executed by Larry Bones, the venerable owner of the makeup effects giant Bone Yard Effects, this haunt had so much promise. But it’s requirement that all guests go through completely alone was what made it a unique and nail-biting experience for even some of the most experienced haunt enthusiasts. We had high hopes for this haunt, and it did not disappoint. 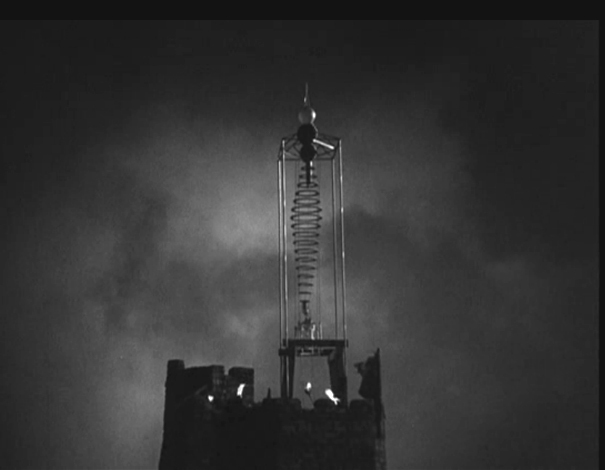 But we wondered whether the single-person model would be lucrative enough to allow Into the Black to return in 2018. 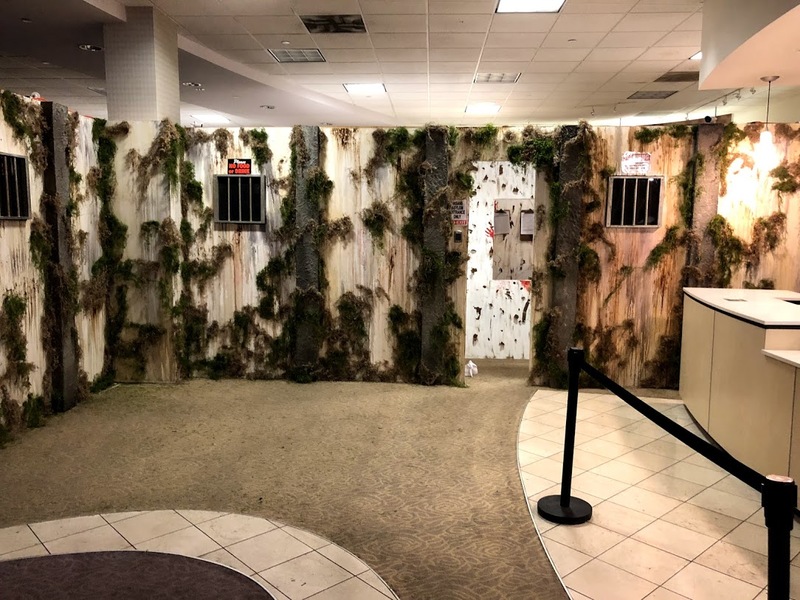 For 2018, the event has moved into the Puente Hills Mall in the San Gabriel Valley and will include THREE haunted mazes, a virtual reality experience, a collection of vendors, and a blacklight horror-themed game area. Discover the twisted history of the 19th century home belonging to the infamous, devil-worshiping, and occult-following Black family. Are you brave enough to enter completely ALONE? Step inside the halls of the Psycho Sanitarium, a crumbling reminder of humanity’s ability to neglect and mistreat those deemed “unfit” for society…but what happens when the tormented fight back? Experience the chaos within the newest maze from Bone Yard Effects, Inc.
Abraham and Sarah Kearny had it all, a happy marriage, 5 children, and a successful livestock farm. Until they were found brutally murdered and their farm burned to the ground. The spirits of the violently butchered family cannot rest. They continue to haunt their land while they seek vengeance for their untimely demise. Can you survive? 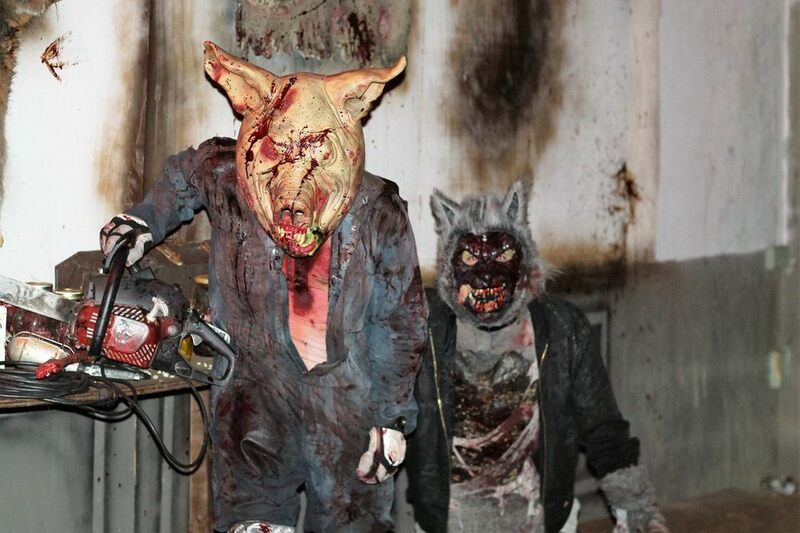 HorrorWorld makes its debut on September 28 and runs select nights through Halloween. We highly recommend buying tickets in advance for this event as space is limited each night. For more information, visit their website. 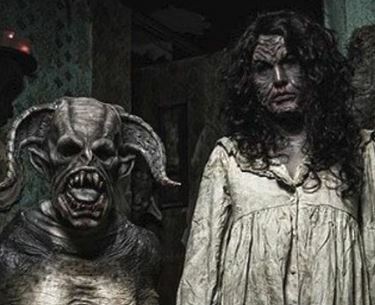 Over the past few years, we’ve watched virtual reality become a growing part of the haunted attraction industry. From Delusion to Into the Black, more and more haunts are using VR to augment the guest experience. So it’s only natural that stand-alone VR experiences are tapping into the market by creating horror-themed seasonal experiences to coincide with the haunt season. 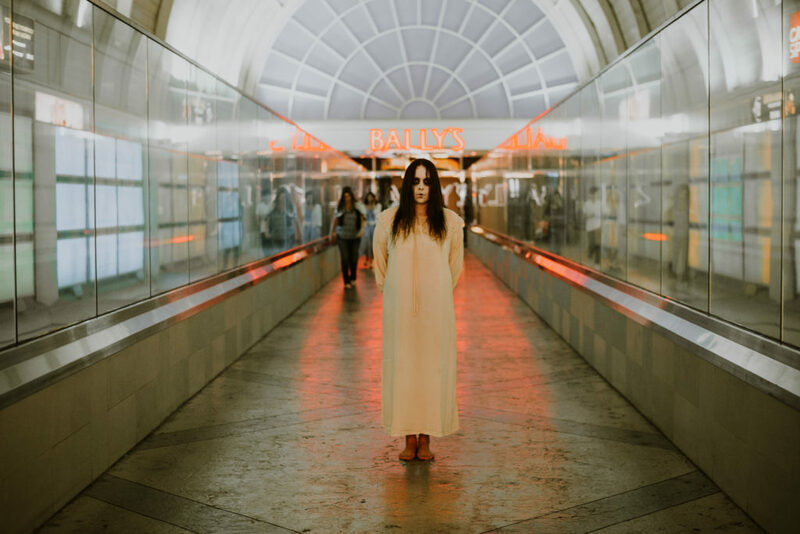 The latest entry into this field comes from the award-winning Hollow Studios and their Jack the Ripper–themed virtual haunted house, which can be experienced at Mountasia Family Fun Center in Santa Clarita, CA. This immersive VR experience transports groups of up to 4 people back to 1888, where Jack the Ripper is on the rampage. 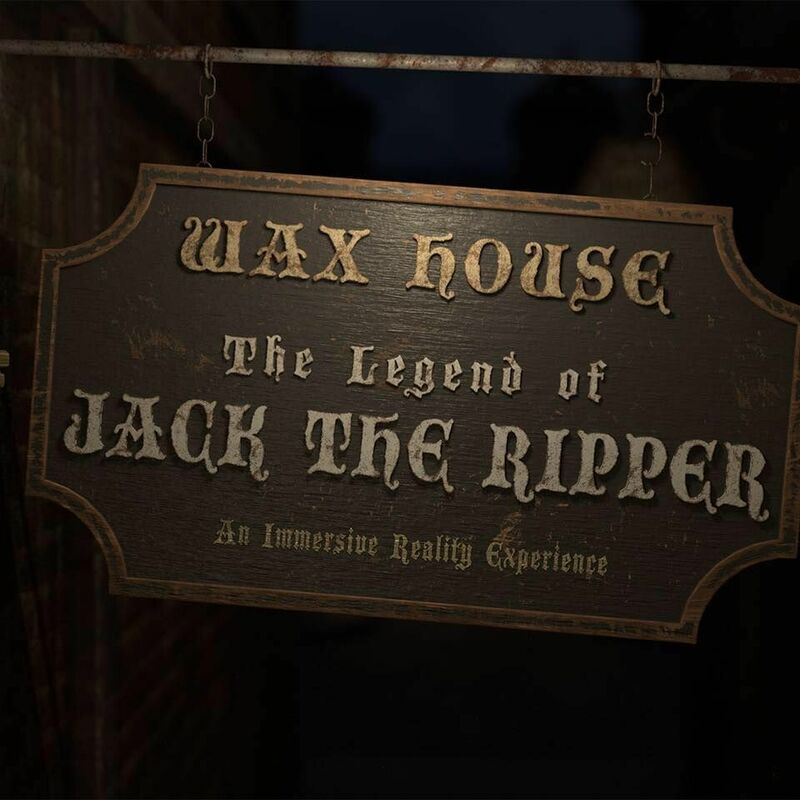 Guests will have to work together while exploring the mysterious wax house to find clues to solve the mystery of the Ripper’s identity. This multi-sensory virtual experience will be part haunted house and part escape room. 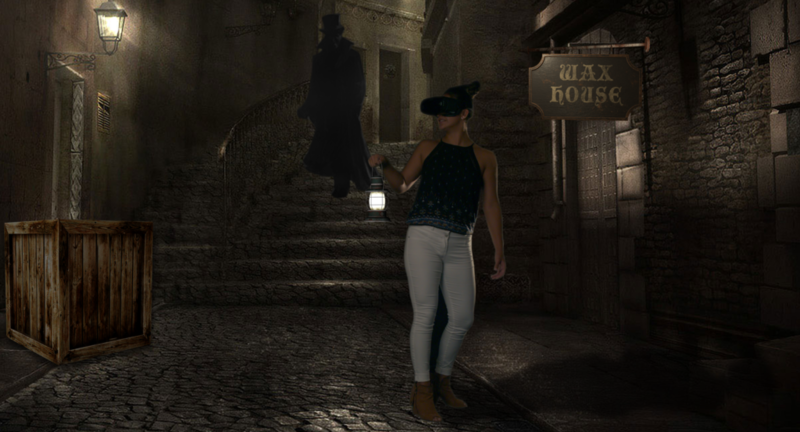 Guests will have 30 minutes to explore the VR world, where they will have to search for clues (for example, by picking up and holding objects, opening drawers) with the goal of escaping before they become the Ripper’s next victims.